Last year I read my first book by Donna VanLiere - The Christmas Secret (linked to my review) - and absolutely loved it! It was one of my favorite reads last Christmas. Therefore I spent after-Christmas sales hunting for VanLiere books which I set aside to read this year. 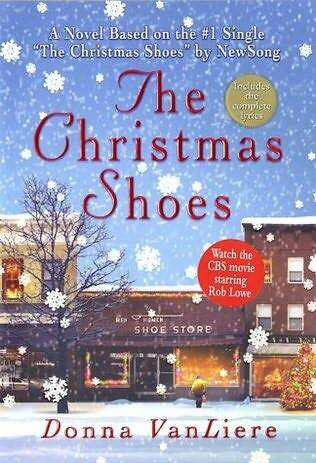 One of the books I found was The Christmas Shoes . The song inspired VanLiere to write the story that she did. I dove into The Christmas Shoes with eager anticipation and in no way was I disappointed. VanLiere tells a beautiful story with characters that you can easily identify with. The story involves two separate families, each with their own issues. In one family, the mother (Maggie) discovers she is suffering from ovarian cancer and is not going to recover. The other family is going through the heartache of a possible divorce because their life priorities have been misplaced. Robert, the father of the second family, is a work-a-holic and can't seem to figure out how to get out of the office in order to spend time with his family. It is through a brief encounter with Maggie's son that Robert realizes that he is about to lose the greatest gifts he could ever hope to have at Christmas time - the gift of his wife and two daughters. This really is a remarkably touching tale. At the same time, I have to tell you, that I bawled my eyes out through the last half of it. I'm not sure that's really what you want to do with a Christmas story but in this case I think it is a compliment to the power of the storyteller. Maggie is dying of cancer and the scenes that VanLiere describes were remarkably similar to those I experienced with my family as we watched my dad died of cancer last year. The words the family speaks in The Christmas Shoes , their emotions and struggles all hit very close to home and I was glad I read this book during nap time, when Jonathan was at work, so that no one was around to witness my red eyes and drippy nose for awhile. The tears just flowed. And I totally fell in love with the story. I would even probably read it again. The story hurts but it's so beautifully told that I cannot resist it. I was therefore delighted when I saw that our local Christian bookstore had copies of some of the movies which are based on VanLiere stories, including the movie version of The Christmas Shoes . Jonathan was even gracious enough to watch it with me, even though I warned him that if it followed the book I was going to sob endlessly. The movie stars Rob Lowe (of West Wing) and Kimberly Williams (Father of the Bride fame) so I had high hopes that this movie would be well-made and convincing. It really does have so much potential. But it does not follow the book. Oh yes, Maggie exists and she is also dying - of congestive heart failure. Robert exists, but his law practice looks a little different from the book. The two families have lives that are intertwined in the on-screen version, instead of separated with a "chance" encounter as in the book. Therefore I found the movie far less creative. I don't necessarily mind if a movie takes a few liberties with the story, but I do like the movie to hold true to the spirit of the book. In this case, I didn't really think the movie accomplished that. In fact, it irritated me that they went so far as to change some of the character qualities that I was most impressed by in the book. Graciousness within Maggie's family simply didn't exist on screen. Family members were cut from the script. Robert's family isn't threatened with a divorce - just general lack of understanding towards one another. Because of those changes I didn't find the story as impacting on screen as I did in the book. It's an ok movie and I might have liked it if I hadn't read the book first. But! Since I did, I didn't care for it. I picked up an extra copy of The Christmas Shoes book and would like to pass it along to one of you, along with my copy of The Christmas Shoes movie . (If you think of them as two separate stories with a common theme that might help.) This is just a little gift from me to you involving one of my confirmed favorite Christmas authors - Donna VanLiere. I have another of her books on my shelf and am looking forward to collecting everything that she has written! I just love her stories. Be prepared to cry. But then again, I do believe the tears are a compliment. If you think you can handle it and would enjoy the book and movie, please leave a comment below. I'll make this a short contest and will close it on Sunday, December 5th so that there is time to get this to you in time for you to enjoy it during the holiday season if you so desire! U.S. Residents only, please. I picked up one of her books at the library on Saturday. I thought I remembered that you had read one last year. Anyway, I'm the words of a fellow teacher I once knew, "I love a good catharsis," so sign me up! Last year I recorded several Christmas movies. I think Christmas shoes was the only one we actually watched. And yes, Derek laughed the whole time...at my crying. I would definitely like to read the book. I love a good Christmas story and a Christmas movie with the family. Thanks for great giveaways...building the Christmas spirit around here! I blogged about your special week. oh that song makes me cry so hard its so sad!!! I wasn't familiar with the song, but I have seen the titles and thought I really did need to check them out someday. I'd love to win them! I have heard about this, but I haven't read the book or seen the movie. I would love to able to. I've seen this book before, but never picked it up. Thanks for your post about it and the giveaway. I love a good tearjerker and would definitely enjoy The Christmas Shoes book and movie :) *Thanks* for the giveaway! This sounds like something I could share with the grand kids during Christmas vacation. In the pod next to me at work, one of my friends slowly died of lung cancer. Last year, I had the scare of possibly having Multiple Myleoma and then later of Lymphoma. I am still being monitored for MM but so far I don't have it. But I sure know what it feels like to be told that you may have cancer. I would love to read this book because it deals with it. This sounds like a wonderful book and movie. Thanks for the giveaway. Yesterday, I was trying to make a Christmas reading list for myself and came across this series. Then I saw this post -- perfect timing! I got 'The Christmas Hope' from the library. Looking forward to it -- thanks for the introduction to this author! Love both this book and movie! Thank you for the giveaway opportunity! Oh, thanks for the giveaway. Would love to win it. I read all of her books last year, but i havne't watched the movie yet. I've never read anything by her so this would be lovely to win! I would love to read the book and see the movie. I am very excited at the chance to read this book. I figure I'll probably feel the same about the movie once I read the book, but I'd still like to see it anyway. I hope I win! I enjoy holiday stories and movies. I'd love to read and watch these. 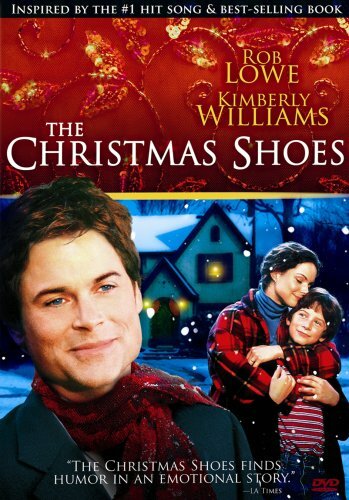 I always cry when I hear the song The Christmas Shoes so I would probably cry in the movie too. Would love to be entered into your giveaway. Thanks for the chance. these sound wonderful.Please enter me in the giveaway.Thanks for the wonderful giveaway.augustlily06(at)aim(dot)com.